A revolution is brewing in the streets of Cascadia’s major cities. Not since the mid-20th century has this region seen such a wholesale remaking of city rights of way. Rapid growth is driving experimentation in ways to move more and more people through the same corridors, whether by foot, bicycle, transit, rideshare or private vehicle, all while accommodating a rising tsunami of deliveries. And as as ever more buildings fill urban space, those public rights of way become critically important refuges for greenery. Until recently, traffic engineers designed streets solely to move cars. For them, street trees were to be eliminated as roadside hazards and landscaped zones were a hindrance to “vehicle throughput.” Today, though, planners increasingly see space for trees and plants as vital to safety, clean waterways, and resiliency and adaptation to climate change. Adopted by more than 1,200 jurisdictions, Complete Streets policies aim to convert rights of way designed primarily for people in cars to also provide protected space for people on foot, bicycle, wheelchair, or transit. More than 30 US cities, ranging in size from Macon, Georgia, to Portland and New York City, are pursuing Vision Zero. Through a combination of street design, education and enforcement, the program seeks to bring traffic deaths to zero in coming years. To meet requirements for water quality and grapple with intensifying rainfalls caused by climate change, many cities are supplementing concrete pipe systems with “green stormwater infrastructure” (GSI) that uses vegetated areas to collect and filter water. A growing body of research shows that an “urban forest” provides ecological, economic and even public health benefits. Portland, Seattle, and Vancouver, BC, have all created aggressive programs to preserve and expand tree coverage. Also, some of the same techniques that can be used to calm traffic and create safe zones for people on foot or bicycle offer opportunities to introduce more soothing vegetation and ecological functions—ensuring that complete streets are green streets. Perhaps not surprisingly, Cascadia’s coastal metropolises are among the leading cites experimenting in this vein. Critical needs—cleaning salmon-supporting waterways and preparing for more severe rainfall from climate change—have steered the region toward innovation to capture, store and clean street runoff. But those cities are not alone. Philadelphia in 2016 released a Green Streets Design Manual that explicitly expounds on the city’s 2012 Complete Streets Design Handbook. That historic city’s effort to bring nature to the right-of-way is central to the Green City, Clean Waters plan to convert 10,000 acres of impervious pavement to rain-water absorbing greenery, under a 25-year project to slash combined sewer overflows and comply with federal law. One of the architects of the Philly program was Mami Hara, who became general manager/CEO of Seattle Public Utilities (SPU) in 2016. “We were trying to prove that green infrastructure can perform the technical needs for stormwater, but we also wanted to demonstrate other important values,” she said. Denver began to rethink its approach to streets as long ago as 2008 with an initiative that came to be known as Living Streets, said Crissy Fanganello, the city’s director of transportation and mobility. The city adopted a complete streets policy and began installing protected bike lanes and retrofitting larger streets to reduce speeding and provide refuges for people on foot. Then came a post-recession development boom, with growing numbers of people walking and biking in the city’s denser neighborhoods. Even as the intensity of development increased, the city also was under the gun to stop dumping polluted runoff into the South Platte River. In the city’s River North arts district, known as RiNo, work already is under way along 15 blocks of Brighton Boulevard to convert a barren stretch of hardscape into an inviting place to walk, bike or wait for the bus. A first phase of the project is catching half the stormwater runoff, while a second is designed to capture every drop. Along the way, the boulevard will be lined with varying “amenity zones” that can include tree trenches, landscaped planting strips, benches for resting and art to contemplate. The trees provide shade for those on foot, while plantings will separate cars from bikes and bikes from pedestrians. “The tight, green, complete street is the next frontier,” Maryman said. “The marketplaces of both ideas and products are helping.” With the growing demand for such streets, new technologies such as the load-bearing soil cells are emerging to make it possible to provide good growing soil for trees beneath a sidewalk, extending the areas for planting and the life of trees and sidewalks, he said. If necessity is the mother of invention, then dire need is the driver of further innovation. Portland, Seattle, and Vancouver, BC, were all among the first to experiment, respectively, with progressive ideas such as neighborhood greenways, bioswales to manage stormwater, and a network of downtown protected bike lanes. But as each grows rapidly, they find themselves forced to lead the way not only in squeezing in green along with all the modes competing for space; they must also innovate in strategies to overcome bureaucratic inertia and forge new interdisciplinary collaborations. I will take a closer look at each city in subsequent installments of this series. 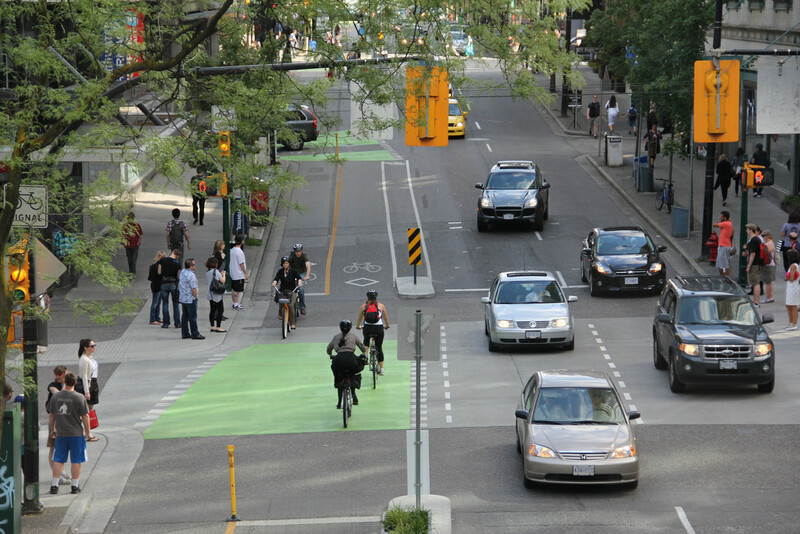 Just about a year ago, Vancouver’s city council adopted what was called “a broader complete streets [policy that] recognizes the importance of looking at streets holistically, bringing land use, green infrastructure, public space and transportation considerations seamlessly together.” An early exemplar of the updated approach will be the Georgia Gateway, a reimagining of a multilane thoroughfare that runs out of Vancouver’s internationally famous Stanley Park, cuts across the mid-century apartment neighborhood of the West End and the sleek condo towers of Coal Harbour to reach downtown. Preliminary plans look to convert a broad swath of auto-dominated pavement to a calmer street with safe spaces for walking, biking and waiting for buses, and possibly a green median and other vegetation to minimize the problematic volumes of runoff, said Rich Carmona, the city’s senior planning engineer for complete streets. In Seattle, where street right-of-way accounts for 27 percent of the land area and there is an ambitious goal to attain a tree canopy cover of 30 percent by 2037, transportation officials have completely overhauled their rulebook for street design. The new Streets Illustrated manual tosses out decades of car-oriented orthodoxy to require designs that calm traffic and improve comfort and safety for people on foot, with street trees and vegetated landscape zones playing a key role. Traffic diverter in Vancouver, by Michael Andersen, used with permission. Portland has been on the green train for longer than most US cities. The city council in 2007 adopted a policy of promoting green streets to manage stormwater with swales, planters, landscaped medians and other strategies. The city now has over 2,000 green streets citywide, said Denver Igarta, Complete Streets supervising planner at the Portland Bureau of Transportation (PBOT). Although the city did not formally adopt Vision Zero until 2016, Portland has been pursuing complete streets goals since before the term was coined in 2003. The next article in this week’s series will look at how Vancouver is adding to the body of experience in creating green and complete streets that take the edge off urban density. After that, I’ll turn to Portland and Seattle. Thanks to Craig Heverly for supporting a sustainable Northwest.